We buy and sell antiquarian, out-of-print and used books. 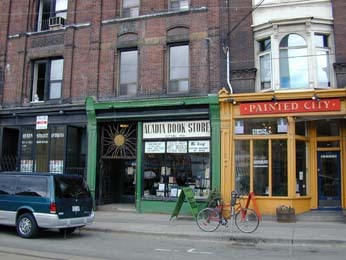 We are long standing members of the Antiquarian Booksellers Associaton Canada (ABAC). We guarantee the authenticity of all the material which we offer for sale. All books are as described, have been collated and are guaranteed to be complete unless otherwise stated. Our store is located in downtown Toronto. Acadia Book Store's online store has a great selection of art books, including monographs, photography, architecture and original graphics. Acadia specializes in out-of-print and antiquarian books. Collectors are sure to find a few surprises in our online listings by searching our collection of over 10,000 books, prints, and maps. Customers are always welcome to call us directly with any inquiries about our stock.